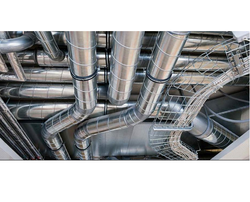 Pioneers in the industry, we offer ventilation systems from India. Backed by a team of skillful professionals, we are affianced in manufacturing, exporting and supplying highly efficient Ventilation System. Find its extensive use in various industries such as food, automobiles, textiles, engineering, chemical, pharmaceutical industries. This system helps to create pollution free environment and is broadly used for the ventilation purpose. Making use of the best grade components and advanced technology, our offered system is precisely manufactured by our dexterous professionals. In order to deliver flawless system at users’ end, this system is duly tested on several quality parameters.